F...and mainly to give confidence to anglers that they can go fishing and by using a good Depth finder and understanding what they are seeing they can go to any body of water and locate fish, establish patterns and Catch fish. That being said hopefully I am helping some of you and here the answer to what is on the screen. That day fish were pretty lethargic and the only fish that we could pattern well were deep. In this shot I had the boat over 48 feet of water pulling downlines at 40 feet deep. 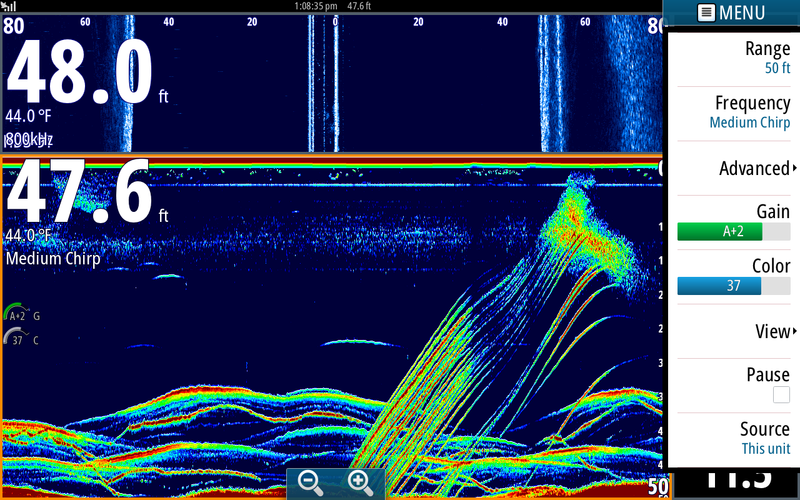 I am using Chirp on my Simrad which shows incredible detail. I tend to use Chirp more when fishing deep and broadband fishing shallower. Lets start off near the bottom of the screen. Remember, I am Chirping which gives me more separation and vivid pics. The bottom shows up on most of the screen as reddish brown highlighted by a bright light green line. The more solid horizontal Brown/green marks are Stripers. The thinner horizontal brown/green lines are my lead sinkers. The squiggly lines near the bottom is my bait that we were using swimming up and down. The more to the center of the cone angle the more pronounced the image is. As the image gets out to the edges of the cone they appear less dense because the signal is less strong. The numerous diagonal lines are White Perch swimming up to feed on a school of 3 inch Herring that are near the surface. The screen moves from right to left, what is happening currently under the boat is on the right side of the screen and as the screen scrolls to the left it becomes history. Therefore the Perch are swimming up toward the surface, not swimming down. Some viewers thought I emptied my bait into the water and they were swimming back down towards the bottom. If that was the case the diagonal lines would start under the school of bait and they would go from the bait to the bottom toward the right side of the screen. Some viewers thought we were reeling in a bunch of Stripers, I only wish that was happening in the picture. I have posted some shots of us reeling in fish in previous posts. Thanks for your opinions and enjoy my future posts. If anyone has questions about Lowrance or Simrad units let me know. If you don't want your questions viewed on the net you can email me at Jim_Hemby@hotmail.com. Lets all hope this weather breaks soon so we can all get out and enjoy boating and fishing.